You Can Save Money on Your Annual Fuel Bill! You can save money on your annual fuel bill, giving you more cash in your pocket to spend on the things you want! Everyone’s mind turns sooner or later to how you can save money on your annual fuel bill. Well, the good news is that if fuel saving is your desire, we are here to say how your desires can become reality. The biggest improvement to your fuel saving aims can be offered to those of you with open fires. Open fires are great and look fabulous, but they need taking in hand if they are not to make away with all your spare cash. What appears to be an innocent little fireplace is actually a portal to energy waste, as the warm air that you have spent so much on to heat it up to a liveable temperature is rushing up the flue in a futile attempt to heat the outside world. The simplest and cheapest way of reducing this and start fuel saving is to insert a chimney balloon into the throat of the fireplace. This is surprisingly effective, but don’t worry about trying to seal it off perfectly, as it is good to have a small amount of warm air going up the flue. This ventilates the house and keeps the chimney sweet without wasting too much warm air. Now if you are terminally wedded to your open fire, and nothing, but nothing will ever make you consider alternative heating, then the chimney balloon is about as far as you can go. However, you need to be aware that if the thought of all that warm air disappearing up an unused chimney was worrying, then what happens when you start using it is an absolute nightmare. As soon as you light the fire, that flow of warm air up the chimney becomes a raging torrent of hot air, and the needle of the Energy Waste-ometer flips into the red and wraps itself round the maximum indicator. Open fires waste heat faster than anything I know, and it is SO unnecessary. The solution is to install a wood burner. Now I realise that in these times of tightened belts, advising you to go out and invest in a wood burner and a chimney liner will not get me onto your chimney card list any time soon. I realise that for most of us that is a serious investment, but it is also a serious investment, that will repay itself many times over. People talk about double glazing, but that takes 75 years to amortise itself. Wood burning stoves really save money on your annual fuel bill so they do that in a fraction of the time. Plus, when you go to sell your house, it is a huge incentive to potential buyers, as well as increasing your property value by up to 5%. Everyone appreciates fuel saving. 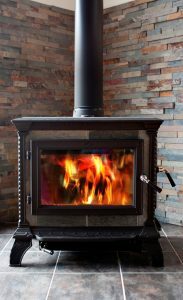 In effect, a wood burner is a large chimney balloon, in that it closes off the chimney as soon as it is installed, but when you light it the real savings start. Because the flue is more narrow, and the air so controlled, you can play the stove like a musical instrument, only heating it to the extent that is needed, whereupon you can shut the air down, putting the stove into slumber mode for as long as is required. Try doing that with an open fire! 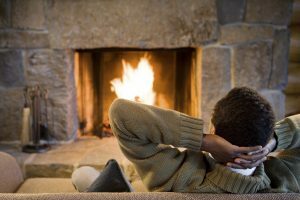 Burning wet or unseasoned wood in essence means more energy is focused on burning the moisture off as opposed to coming back into your home as heat. For further information on this read our article on Fuel for Open Fireplaces.